This competency framework was developed after analyzing the results of a series of large competency studies conducted by a number of major U.S. corporations. These studies were conducted to determine which competencies highly effective managers and supervisors possess to a greater degree than average performers. The 12 competencies selected for inclusion in the Excel2 series were identified by all these studies. They are fundamental building blocks for becoming an effective manager and are preconditions for effective leadership. The instructional design of the Excel2 workshops is based on several important principles of adult learning, -- the most important of which is that learning occurs best when it is related to past experiences and current goals. Learning Objectives for each competency focus on the attainment of new knowledge, attitudes, and skills. These behaviors are learned, practiced, displayed and evaluated during training through experiential activities that include hands-on exercises, role plays, script analyzes, games, and self inventories. Learning objectives support a central behavioral model for successful mastery of the competency. Every workshop participant creates an individual action plan shared with their managers, work team, and stakeholders. This is the vehicle for transferring learning to the workplace. The planning focuses on performance criteria: the application of competencies to organizational problems and situations. Excel2 has been designed to provide training that leads to “terminal behavior change” or in layman’s terms, learning that will be applied on the job. Instructor’s Guide: The Instructors Guide bases the detailed lesson plans and content on learning objectives. Participants interact in activities and discuss information presented in the workbook. Power Point Presentation: Slides provide the instructor with an easy-to-use, flexible way to liven lectures and discussions. Video: Short video segments from MAP2, the number one video based assessment in the world, are used to illustrate the 12 Excel2 competencies in use on-the-job. The (MAP2), Managerial Assessment of Proficiency was developed concurrently with Excel2 to assess a managers strengths and weaknesses in these 12 competencies in addition to providing information about a manager’s personal style, communication style, and managerial style. Film sequences show managers using both incorrect and correct techniques related to the Excel2 competency. Participants evaluate and discuss the techniques observed. Participant Workbook: Workbooks provide learners with additional lesson content, as well as experiential activities, handouts, and action-planning forms required to complete the course. Participant booklets for each workshop are sold separately for $20 each. 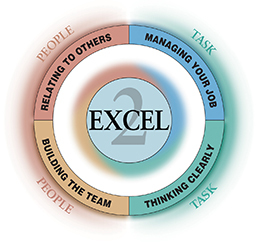 Train-the-Trainer: Professional training experts is available to deliver Managing to Excel2 workshops or provide training for your internal training staff.